Over the 30 years of its history, the space shuttle has had an indelible impact on America. The United States' spaceship of choice for three decades helped build the largest space station in history, revolutionized science with the launch of the Hubble Space Telescope, and inspired generations who dreamed of riding the shuttle into the sky. "The shuttle for me is nothing less than the father of anything that will fly in the future," said Italian astronaut Roberto Vittori, who is slated to take his first ride aboard a space shuttle when Endeavour launches on its final flight on April 29 . Many have echoed this statement, saying the vast knowledge gained from flying the space shuttle for 30 years will significantly influence future generations of spaceships. When it first arrived on the scene in 1981, the space shuttle was revolutionary. The space shuttle has been integral to many of the most impressive space achievements over the last three decades. "It has such a great historic, amazing record," NASA astronaut Michael Fincke, who is also slated to ride on Endeavour's final flight, told SPACE.com. "It built the space station. This is the hugest, biggest piece of space hardware that human beings have ever built, and we couldn’t have done it without the space shuttle – even the Russians admit that." 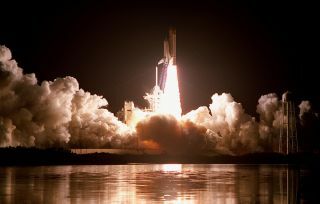 The shuttle also launched the Hubble Space Telescope, which has offered humanity an unprecedented view of the cosmos and reshaped our understanding of cosmology. When the observatory initially produced blurry images because of a fault in its mirror, astronauts aboard the space shuttle made a nail-biting repair visit to fix the optics. The shuttle has the largest cargo-carrying capacity of any spaceship flying today and has delivered most of the biggest man-made objects to space. In addition to delivering space hardware for assembly, the shuttle has brought people together. Nations that were once adversaries, including the United States and Russia, now exchange crew to fly on each other's spacecraft. "One of the greatest legacies of the space shuttle has been its ability to open space to more and different types of people," Pearlman said. "Many nations saw their first citizen enter space aboard the shuttle, including Canada, Mexico, Japan, Australia, Saudi Arabia and Spain. The first American female and African-American entered space on the shuttle. The first American of Jewish descent and the oldest person to ever enter space flew on the shuttle, too." In addition to its many triumphs, though, the space shuttle made an impact with its tragedies. Those disasters shook NASA and the space industry, as well as the world as a whole. But both times the space shuttle program stopped to investigate the accidents, then regrouped to come back stronger than before. "Everyone knows the story of the two tragedies and they don’t always know the story of the 130 successful missions," said Smithsonian Air and Space Museum curator Margaret Weitekamp. "We try to balance that story, to be respectful of the lives lost and the lessons learned from the two tragedies and then also highlight the tremendous success of this really versatile spacecraft and the dozens and dozens of astronauts who've made it work, and the thousands of people on the ground who have ensured that that would work." The space shuttle's 30th anniversary on April 12 comes on the 50th anniversary of the very first manned spaceflight – the Soviet Union's launch of cosmonaut Yuri Gagarin into orbit on Vostok 1. "Today we've seen tremendous changes since Gagarin has flown," said Kirk Shireman, NASA's deputy program manager for the space station. "If you look at how far humans have progressed in spaceflight … the shuttle is a huge part of that and continues to be." You can follow LiveScience senior writer Clara Moskowitz on Twitter @ClaraMoskowitz. Follow SPACE.com for the latest in space science and exploration news on Twitter @Spacedotcom and on Facebook.